The organizer of Diversity House called the eviction a "political attack" that demonstrated Russia's issues with human rights. A safe space for LGBT fans of the World Cup was shuttered on the eve of the international sporting event in Russia. Football Against Racism in Europe (FARE), an international human rights group that fights discrimination in sports, said its Diversity House program was evicted from its St. Petersburg location prior to the games. "They asked us to leave the place very rudely, switched off the electricity and they explained nothing to us," a spokesperson told the BBC. Diversity House was intended to be an inclusive location where queer people and people of color could gather to watch the soccer matches in safety. In a statement, FARE director Piara Powar called the eviction a "political attack of the kind that shows how debates about human rights are curtailed by powerful conservative political forces in Russia." Afterward, FIFA, which oversees the World Cup, reportedly tried to contact Russian authorities to resolve the situation. The organization said it "regretted" the eviction, BBC reports. Another Diversity House launched and is operating in Moscow, where both Russians and visitors can gather for viewings and meetings for the duration of the World Cup. 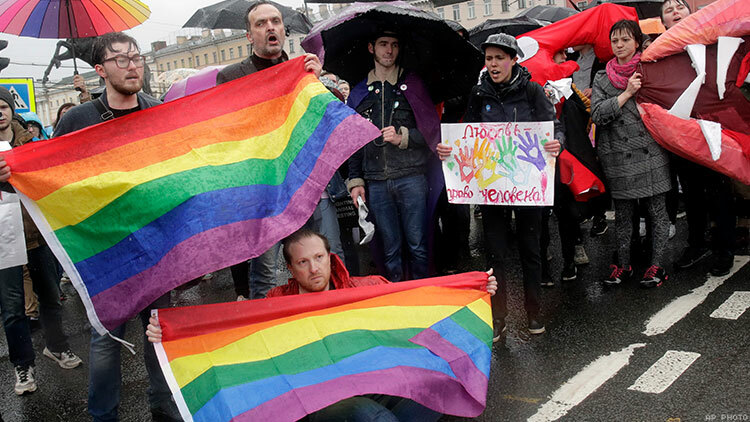 Russia's "gay propaganda" laws prohibit public demonstrations in support of LGBT rights. But antigay attitudes in the Eastern European country have skyrocketed in recent years. In addition, Russia has been criticized by international activists for its inaction toward reports that gay and bi men are being rounded up and killed in Chechnya, a region it controls. Despite the homophobic atmosphere in the nation, Russia’s World Cup organizing committee has assured LGBT fans that they and others will be safe at the games and that displays of pride, such as rainbow flags, will be allowed. But British LGBT rights activist Peter Tatchell was arrested last Thursday in Moscow for protesting the persecution going on in Chechnya. A gay couple visiting St. Petersburg for the World Cup was also attacked, with one partner sustaining serious injuries.